The peat bogs of the world, once waterlogged repositories of dead moss, are being converted into fuel-packed fire hazards that can burn for months and generate deadly smoke, warns a McMaster researcher who documents the threat – and a possible solution ¬– in a paper published today in the journal Nature Scientific reports. Since the glaciers receded about 12,000 years ago, the humble bog has acted as a storage vault for atmospheric carbon, packed with dead moss and topped by a green layer of living moss that can come back after a burn. The world’s bogs hold more carbon than the word’s rainforests, and Canada is home to about 185 billion tonnes of increasingly vulnerable peat deposits, ranging from 40 cm to several metres deep. 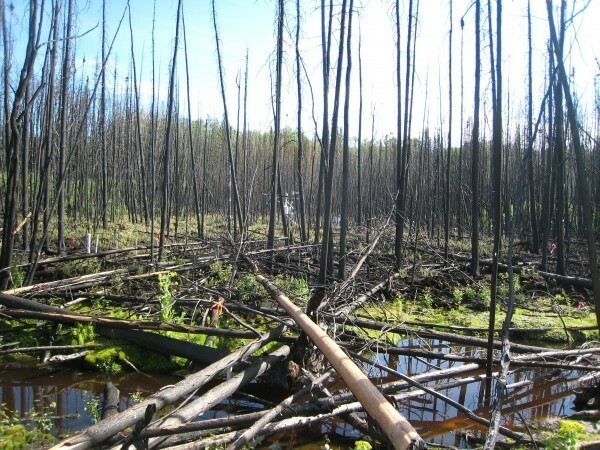 Dried peatlands fuelled a 2011 fire in Slave Lake Alberta, for example, and the recent fire that devastated Fort McMurray also burned through a dried peatland along the only highway in and out of the town. New research from McMaster’s School of Geography and Earth Sciences, led by Gustaf Granath (now of Uppsala, Sweden) and James Michael Waddington (who goes by Mike) shows that peat mining for horticulture and fuel, drainage for agriculture and construction, and overall global warming have made a growing number of the world’s bogs dry and vulnerable to fire that can burrow deep into the ground and burn for months, even through the winter, only to re-emerge. “People don’t think about a fire going down into the soil. They think about it going across the landscape,” Waddington says. Peat mining in Europe and drainage to plant palm-oil plantations in southeast Asia are the sources of the greatest vulnerability, and have already helped to propagate fires that have caused massive destruction and death. In Moscow, smoke from the peat fires of 2010 killed an estimated 3,000 people. Peat fires in Southeast Asia last year released more than 1 billion tonnes of CO2. The largely untouched bogs that honeycomb the vast boreal forests of Canada are also changing in worrisome ways, says Waddington, a professor of Geography and Earth Sciences. In northern forests, black spruce trees have proliferated on peat bogs, paradoxically, because fire suppression has left them to grow largely unchecked. Spruce trees block sunlight, killing the living layer of moss and sucking the moisture out of bogs, not only turning the peat material itself into a fire hazard, but also accelerating wildfires. “You end up with a landscape with a lot more fuel than you would have had,” says Waddington. The research shows that previous damage can be reversed by thinning spruce trees in wilderness bogs and channeling water back into in managed bogs, and planting new moss on top of the old moss (or even what remains of it). The cost can be high, but the cost in deaths, carbon emissions, property damage and fire suppression is ultimately higher, Waddington argues.